Description PERT stands for Program Evaluation and Review Technique. The numbered circles represent tasks or milestones in a project. The arrows show the sequence of these tasks. The time to do a task is shown near the arrow. The critical path in the chart shown above is drawn with red arrows. 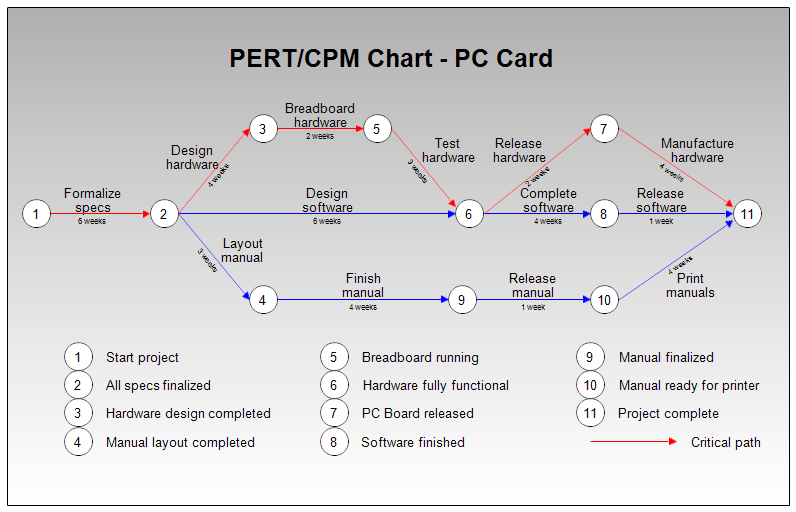 PERT charts display task dependencies, showing which tasks need to be done before others can be started. CPM stands for Critical Path Method. Once RFFlow is installed, you can open the above chart in RFFlow by clicking on pert_hardware.flo. From there you can zoom in, edit, and print this sample chart. It is often easier to modify an existing chart than to draw it from scratch.